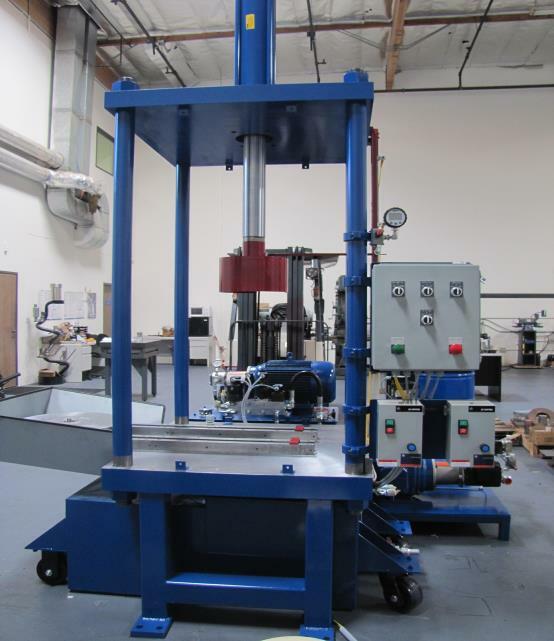 Model HFBV-9810-LVP Liquid Bellows Metal Forming Machine : American Machine and Hydraulics, Inc. This unit is a liquid bellows forming machine of low production output. It is ideal for companies requiring a limited amount of bellows per day. The tooling is economical and easy to setup and disassemble. Depending on the design of the unit, bellows from 1/8” ( 3.1mm ) up to 48” ( 1.2meters ) can be formed at tube starting lengths of 48” It is capable of forming forces up to 25,000 psi hydraulic or water system pressure. Water can be used for forming if required. The unit has a dual pumping system. The forming sequence is automatic. The tooling set up and dis-assemble is manual. A PLC electronic system controls all the pumping and forming cycles. Production output can range up to 100 units per day . Form cycles can be as rapid as 3-5 seconds. Allot depends on the amount of convolutions and diameter of tube. The unique design of the forming tooling allows for greater economics. We provide you with tooling drawing so you can create as you go. A specification chart in back of this flier allows AMH to design the right machine to fit your needs. Power supply with the high and low pressure system. Low pressure pump on left and high pressure on right.